With both online and in-person payment options, members can pay from the comfort of their home or you can collect payments on-site at events easily and securely. More ways to get paid means you can choose the payment options that work best for your association and your members. With centralized payments, you can ensure that all transaction data is organized in one simple-to-use location, no matter how many different tools your association utilizes. 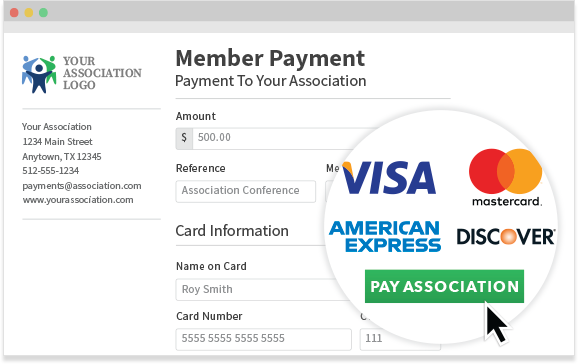 In addition to accepting payments through your website or through most major AMS solutions, AffiniPay gives you a few simple ways to collect payments from members. Get your own secure, customizable payment page to process payments. Use your payment page to run charges in person, or link to it from emails, invoices, and your website to give members a simple, seamless payment experience. Help members pay quickly and easily, with just a click. Quick Bill lets you send members a link to a customized payment portal, where they can view and pay multiple Quick Bills. View, manage, and track Quick Bills right from your AffiniPay account. Schedule payments in advance for sponsorships, member dues, donations, and more. With our free Scheduled Payments feature, collecting payment is simple and convenient for both you and your members.